Make the most of your heating appliance with this convenient remote control. Compatible with any appliance that uses a Signature Command System, the remote provides many options for comfort. The device features a manual on/off and auxiliary control, a 3-level adjustable flame height, a 3-speed blower, and a 6-hour countdown timer. Its radio frequency operating system allows accurate and dependable operation from up to 30 feet away. Handy features include touch screen technology, an LCD with back lighting, a low battery indicator, a thermo shutdown, and a childproof lock-out for additional security. All batteries are included with the remote. Would this work for a Vermont Castings Radiance unit? This will depend on the unit. Does this remote come with a receiver and transmitter? Is the back lit screen easy to see? Will it work with a majestic fireplace with TPTH and TH connections? This remote will only work with Majestic/Monessen models with the Signature Command systems where the remote would sync with the control board and not the receiver. Furthermore, you would have to also install the Signature Command blower and Signature Command AC Control module for this remote to provide the functionality described on the product page for this remote. If this is a basic On/Off millivolt (standing pilot) system as it appears to be, you would only be able to use an On/Off or On/Off thermostat remote control. 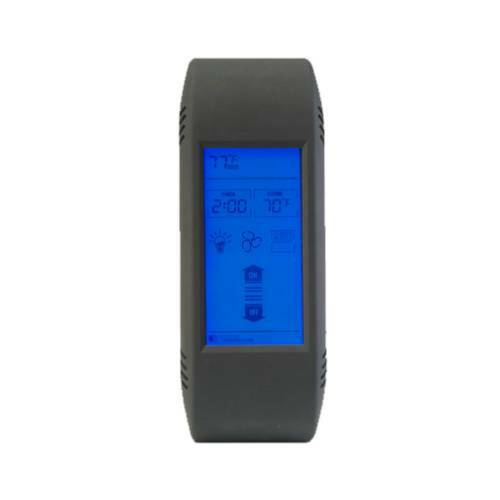 While this will only provide On/Off thermostat control, Ambient does offer the Ambient TSST Touch Screen Hand-Held Thermostat Remote Control if you are simply wanting a touch screen remote. To determine all remote options for your fireplace, we will need to know the model number. I have a 300DVBN fireplace - will this remote work with it? This remote would indeed work for your unit. This is a very handy controller for the fireplace. No more taking the lower panel off to start and stop the flame and fan. Enjoy the different options for control. You can set a temp on the remote and the fireplace will turn on and off as needed to maintain that temp. You can also choose to just turn the fireplace on and let it run until you turn it off. There is also a timer option that I have not tried out yet. ProsWorks from anywhere in our living room. Easy control of the three fan speeds and the three flame heights. ConsTouch screen is somewhat slow to respond at times.